Amazon already sells its own brand of batteries, keyboards and bedding. And now it looks as though the Seattle-based online retailer is in the process of creating its own line of the kind of products that you’d normally find on supermarket shelves, according to several job listings the company has posted over the last few months. The consumables business at Amazon includes categories such as grocery, health, personal care and baby products. The AmazonFresh grocery delivery business also is part of the area. Scott Stanzel, an Amazon spokesman, declined to comment. While the job listings hint at the broad division for which Amazon is looking to develop products, it’s not clear whether Amazon will target its own brands at just one product type — say, diapers or snacks — or across all of the categories. At their core, private-label brands often let retailers increase their margins by cutting out middlemen. They can also often help keep prices low. A few years ago, Amazon launched Pinzon, its own brand of sheets and towels. It also sells a private label called AmazonBasics, which includes products such as batteries, keyboards and USB cords. But the company hasn’t aggressively marketed the private-label brands in recent years and rarely mentions them in media appearances or on analyst calls. “In theory, there are a lot of ways they could go with [private labels], but it’s not something they really discuss or push on their own site,” he added. Big-box and grocery retailers have waded into the business of developing and selling their own brands with different levels of aggressiveness in recent years. Target, for example, has had success selling its own brand of diapers, called up&up. It has also carved out a niche in snacks with its Archer Farms brand. Then there’s a grocer such as Trader Joe’s, whose whole business is built around selling a limited number of products, the majority of which carry the chain’s own branding. 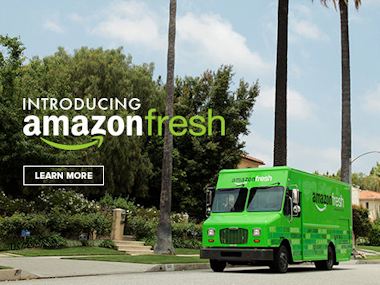 Critics of Amazon’s expansion into same- and next-day grocery delivery with AmazonFresh have noted that tech history is littered with companies such as Webvan that have tried and failed to build profitable grocery-delivery businesses that span the U.S. In theory, at least, an aggressive move into selling its own grocery brands could help boost profit margins. “I think that could make a ton of sense,” said Mark Mahaney, an analyst at RBC Capital Markets. But, based on the company’s history with selling its own brands, it’s difficult to imagine Amazon-developed products becoming big contributors to the top or bottom line, Mahaney added. “I’m not surprised they are doing this, but I’d be surprised if it had a material impact,” he said. That Giant Bitcoin Crash in the Wake of China Restrictions? It Never Happened. A New Perk for Google Employees? It Could Be Low-Interest Personal Loans.